Guess what I have to share with you today? 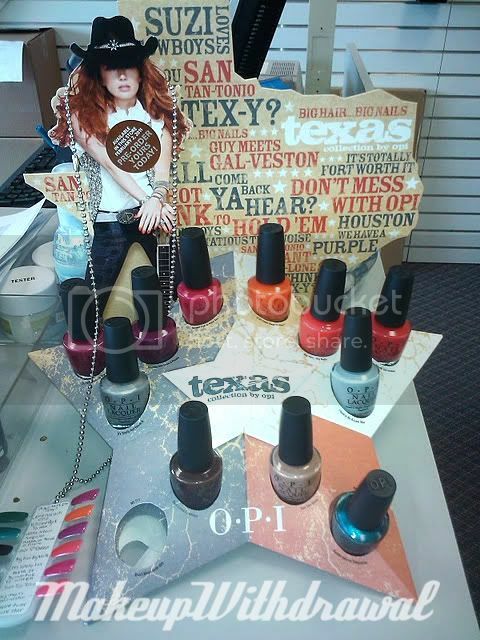 A sneak peak at the upcoming OPI Texas Collection. Here we have both the display at CosmoProf and a picture of the swatch wheel. Now pay no mind to how blue the display picture is, I had to take it with my cell phone camera and chose the wrong setting. The swatch pictures on the other hand, are much truer to the actual colors. The girl working at CosmoProf gave me such a weird look when I asked if I could take a picture of the display- equal parts disdain, I-think-you're-crazy eyeball rolling and surprise. But what do I care? I get to show you a new collection. Half of this collection contains warm, fruity colored cremes while the other half contains a few interesting surprises. The shades that intrigue me the most include I Want To Be A-Lone Star (a pale pearly blue with lavender shift) and Don't Mess With OPI (a cheeky green creme) but I wouldn't associate either one of those shades with Texas! Maybe it's just me- what do you think of this upcoming Texas collection?